A few months ago we finished a redesign for attydc.com and started a renewed SEO push as well as a social networking campaign. I was talking to a different attorney (located in a different state from the existing client) today who mentioned that she was needing to redesign her website and do some search engine optimization. I sent her the following stats information about attydc.com’s Google ranking. These are the search terms followed by the site’s ranking for that term. In a lot of the cases where attydc.com is not the #1, there are usually directory websites (as opposed to a direct competitors) ranked above them. This doesn’t even factor in that there are 12 or 13 practice area pages for each of the above locations that are also optimized; I just don’t have the time to look up and report over 225 search engine results. High ranking doesn’t mean much if you’re not gaining extra traffic, but looking at the stat reports I noticed that visits and unique visits are both up about 49% from when we retooled the SEO and started the social networking. I’ve been told by the client that they’ve definitely noticed an increase in phone calls as well. This stuff works, folks. Contact us today to discuss how we can help your website rank high in search engines and increase your traffic. Having a blog on your website, and by “on your website” I mean one that is fully integrated into your site, not just an offsite link, is one of the most powerful tools available to businesses of all sizes today. Here are five reasons your company really needs a blog. Ask anyone who knows about SEO and they’ll tell you that the golden rule in search engine optimization is that content is king. A blog allows you to write content that is pertinent to your website that may not quite fit in on another page of your website, and the more relevant content you have, the more it’s going to help your site’s ranking. On top of that, search engines also like to see that a site isn’t stagnant. When you have a blog you’re adding new content to the website, which tells the search engines that the site is active, not something that was just set up and left to hang out to dry on the web. Another SEO benefit to having a blog is that you might have people leave comments or ask specific questions regarding an article, which adds even more content to the site. I can’t tell you how many times I’ve typed a question into Google resulting in me finding someone else asking the very same question in the comments section of a blog article. Isn’t increasing traffic through search engine optimization the same as increasing online exposure? Well, no, not exactly. Increasing (targeted) online exposure, or a web presence, is one goal of search engine optimization, but a blog can help you link to other online services such as Twitter and Facebook. By posting your blog entries to these services, you keep your Twitter and Facebook pages from becoming stagnant and give people a reason to follow you. When people follow you they see your updates, and when they see your updates your online exposure increases. If you are in business, chances are that you know something about your field. If you’re a web designer you may not know every detail about the differences between PHP4 and PHP5 (and hey, I don’t, but I’m not a programmer; I leave that to Scott), but chances are you know more about programming than the average guy off the street, and you can talk about it. A better example might be this: You’re a plumber who’s been at it for a few years. You may not know as much as the guy below you on the search engine results page who has been plumbing for 30 years, but you can write about plumbing and give people tips and advice, so that people will see that you do have knowledge and are approachable, they’ll contact you instead of that other guy. Blog articles give you authority. It’s also good for just giving people other information about your business, like when you’re going to have a sale or when you’ve hired a new staff member. People like to feel like they know you. That brings me to another point: people want to know who they’re doing business with. If you have a friend or a friend of a friend who offers a service you need done, you’re generally more likely to hire them than someone you’ve never heard of, right? People have different writing styles, and your personality can show in your writing. Blog writing is generally laid back and conversational. Now, that doesn’t mean you should write like a fourteen year old on Facebook, but it doesn’t mean you have to act like you’re writing a technical manual either. Let your personality come out, and don’t be afraid to share a little about your experiences (so long as you’re not trashing anybody; that doesn’t make you or them look good). If your prospective customers feel like they know you they’ll not only be more apt to use your services, but to share your articles on Digg, Twitter, Facebook, email or some other form of social networking. There are other benefits of blogging as well, and the fact of the matter is that it’s really not that hard to do. There are plenty of blogging programs out there (my favorite being WordPress) that you can learn the basics of in a matter of minutes. There are so many positive reasons why a company should have a blog that I really can’t think of any excuse good enough to get in the way. “I can’t type very good.” If you wrote that, then no, you don’t. But you know what? You probably have an employee who can type well and would like to help the company out by writing blog posts. Maybe a salesperson or a secretary, or both! And if there really is nobody in your company who can spend a little time writing your blog, hire a freelance writer. Yes, there are people out there who make careers out of writing blogs articles for people who can’t find the time to do it themselves. It’s worth it. “I don’t know what to write about.” Make lists. List the things a customer should look for when hiring a company in your field. (Note: Make sure you live up to the things you list!) List some resources you use. Talk about services you provide. Review products. Talk about events your company is involved in. Talk about a new hire, a new job, the process you go through when creating a new product. Write about classes you took in college or the people who influenced you. Write about anything! There are so many reasons your company needs a blog: search engine optimization, increased online exposure, disseminating information, letting customers get to know you and because getting these benefits and more is so simple, it’s silly not to do it! Years ago it became apparent that any serious company needed to have a website in order to be legit. I think the time is coming where you need a blog as well. If you need help setting up a blog, why not give us a shout? 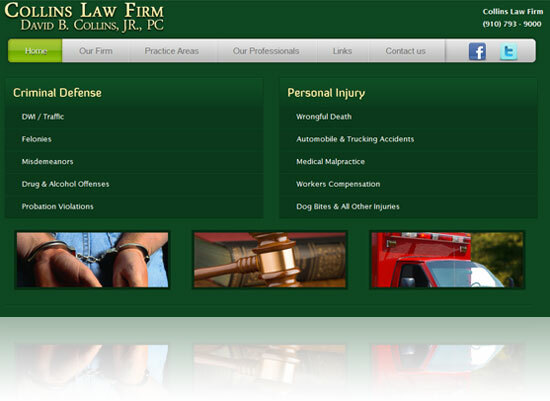 Venuecom and Impulse Web Designs teamed up to redesign www.attydc.com, the website for Wilmington, NC Lawyer, Attorney David Collins. The client’s original website was designed from a phone book ad from six or more years ago. Obviously, styles have changed since then and our first mockup was much more modern; a little too modern for Mr. Collins, who wanted to update the look, but keep it familiar. The challenge was this: the existing website already ranked at the top of Google for the search term Wilmington NC lawyer, but it was not converting, so one of the points we emphasized in preparing this project was that the look of the site needed to be modernized and more engaging in order to hold the attention of visitors and thereby convert more traffic into leads. Collins was pleased with the second mockup by designer Travis Ray. We feel he designer tasked with this challenge did a great job of meshing the old, outdated look with a more modern, pleasing style in the second mockup. In addition to aesthetic updates, over 200 unique pages were added to the site to help search engines index key service areas and locations targeted by the client. Links to the client’s Twitter and Facebook accounts were also added and a WordPress blog is slated to appear soon in order to increase the site’s social media presence. Venuecom, a Wilmington, NC web design company and partner of Impulse Web Solutions, has just been given the green light to redesign attydc.com. The website has been in existence for roughly a decade and has seen no major design overhaul in that time, so Venuecom’s web design team will work on bringing the site up to date with fresh, new graphics and a bolder appearance. However, the client wishes to have the site rank high for other areas around Wilmington as well as for specific areas of law. To that end, the newly designed website will include many new pages of relevant content and feature a blog for the discussion of legal advice, law news and other legal matters. I saw yesterday that WordPress 3.0 was out of beta and available via WordPress’s terrific automatic update feature. I figured if they had it available through that, they must have worked out any auto install bugs, right? I did a little digging around and discovered that I wasn’t the only one. The suggestions were to disable all your plugins (if you don’t have admin access you can do this by simply renaming the plugins directory via FTP) and see if that works, which would mean one of your existing plugins was causing the issue, or do a manual upgrade. Renaming my plugins directory didn’t fix it for me, so I decided to do the manual upgrade, and that did the trick. My WordPress 3.0 blog is working peachy keen now. There’s a lot going on in WordPress 3.0 and I was eager to play with it, but it was pretty late at that point so I messed with the new default WordPress theme, Twenty Ten, a little bit and called it a night. While the manual install isn’t particularly difficult, I’m not going to suggest our clients upgrade to it yet unless they want to give it a go themselves. I’m going to wait until whatever bugs there are in automatically upgrading from WordPress 2.9.2 to WordPress 3.0 are fixed before we go forward with that. Download WordPress 3.0 and unzip the files into the WordPress folder on your computer. Back up your database. This is optional, but it’s a good idea. Disable your plugins. Sometimes a plugin will conflict with something in a newer version of WordPress. You can reactivate them one at a time to make sure there’s no conflict. I usually skip this step, personally, but I do remember once or twice where it caused me a problem. Delete the wp-admin and wp-includes directories on the server. Upload all the WordPress 3.0 files to your server except the wp-contents folder. That folder contains your themes and plugins. Upload the wp-content/themes/twentyten folder. This will give you the WordPress 3.0 default theme, Twenty Ten, which lets you use all of WordPress 3.0’s new features. Uploading this folder separately from the rest will ensure that any other themes or plugins you have are not overwritten. You’ll be prompted to update your database, which takes under a minute, then you’re done and ready to explore the new features of WordPress 3.0! Google has come up with a nice little PDF with a ton of SEO information. It is basically a starter guide for anyone interested in optimizing their site. Optimizing a site is not rocket science, but it does require a ton of work which is one of the services I provide. Check out www.statbrain.com, a free tool to estimate the amount of traffic a web site gets. Statbrain estimates the number of visits that a website has based on offsite factors like backlinks, Alexa Rank, etc. Statbrain does not have access to log files or any counter information. The number of visits that Statbrain estimates gives you an idea of the number of visitors that a website has, but not the exact visitor number.